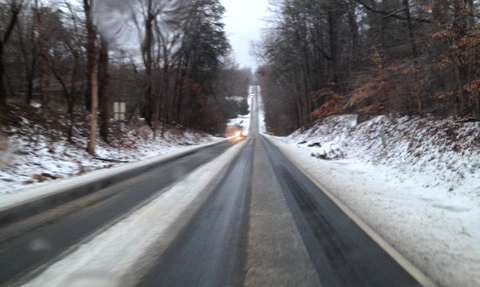 Blue Ridge Life™2012 – Photos By Tommy Stafford : A mix of freezing rain, sleet and snow covered most of Route 151 early Wednesday morning (December 26, 2012) in Nelson County heading through the Rockfish Valley. 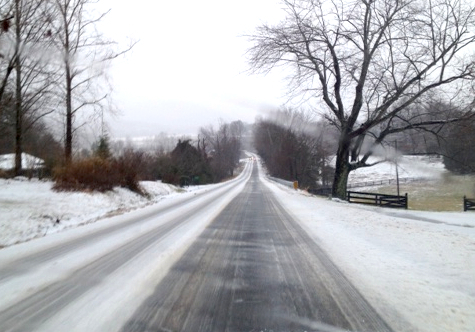 This was near Rodes Farm Drive just north of Nellysford, VA.
As Tommy forecasted in his daily audio weather, a nasty mix of freezing rain, sleet, and some snow hit a large part of the Central Virginia area from as far south as Roanoke north toward the DC area. In the immediate area of Nelson County and the BRP, about 1-2 inches of the wintry mix fell creating all sorts of travel problems across the area. The Virginia State Police along with local agencies report dozens upon dozens of wrecks as a result of the bad weather. In the higher elevations, snow can be seen covering the mountainside. This is looking toward Wintergreen Resort in Nelson County, VA as seen from Nellysford. 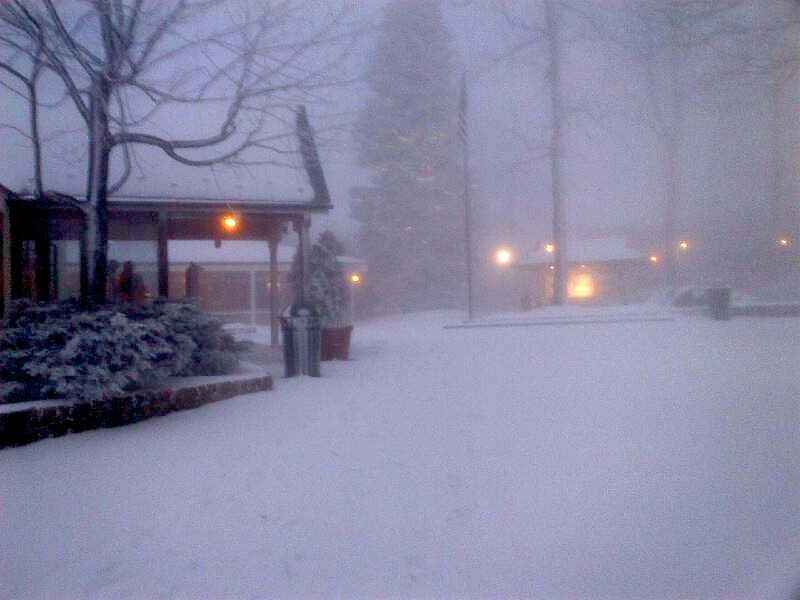 Photo Courtesy of Wintergreen Resort: Up top around 3500 feet at Wintergreen Resort where they already had a ice base of man made snow, mother nature added to it on Wednesday morning. This is outside The Copper Mine Restaurant in the courtyard at the resort. 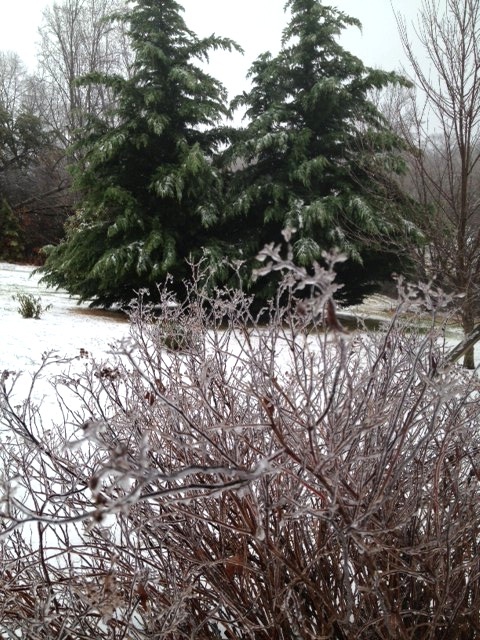 Back in the Rockfish Valley near Greenfield, ice encased many trees as freezing rain settled in for part of the day. By late in the afternoon Wednesday, roads across the area were in better shape with some of the highway showing through. VDOT treatments, traffic, and temps slightly above freezing helped make things better. Some wintry weather is stil possible overnight Wednesday into Thursday, but will generally end in the early morning hours Thursday. Sunshine with very windy conditions arrive on Thursday. Sun continues Friday before another winter storm makes its way to the Blue Ridge by Saturday.